We like the shortcut of using pier blocks at the base of four-by-four posts, but the resulting structure can sometimes be a bit wiggly. 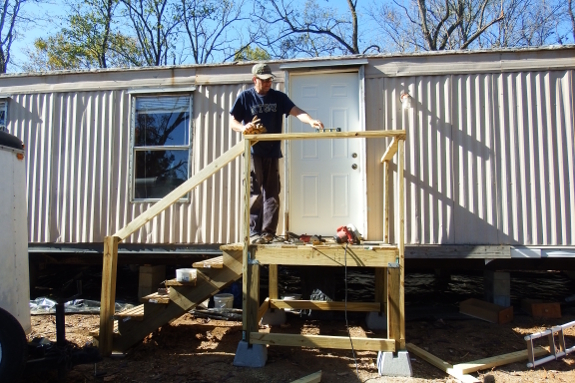 On our new stair landings, we added braces at the bottom to shore up the mini-porch. 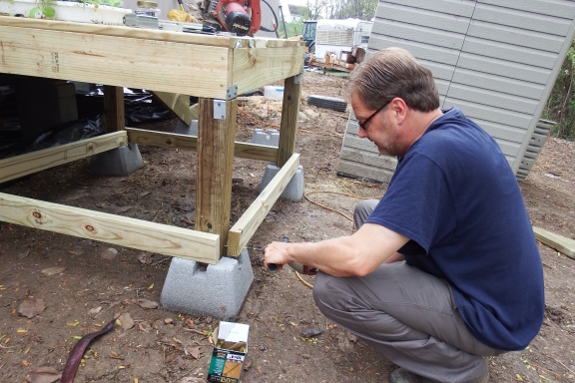 Next up was handrails, mandatory for stair landings more than 30 inches off the ground in our region. Depending on who we talked to, the handrails needed to be 34 to 38 inches or 36 to 40 inches above the porch level, and might need an upright every four feet. We added two additional supports after taking the photo above just in case. Now we just have to fix a GFCI, wrap the water intake to our trailer in heat tape, and install smoke detectors and we'll hopefully pass our upcoming inspection. I can hardly wait to mark the last item off our "have to" list and move on to the "want to" list! We are here from the government and we are here to help :) :). And I am supposed to pay for this 'help'? ?